Portugal is very small, a slim slither of a country clinging on to the side of the Iberian Peninsula, battered along its western coast by the most magnificent of Atlantic breakers, its interior parched under a southern European sun. The strip along the bottom is a tourist haven, its capital, Lisbon, one of the most fashionable destinations in Europe right now, and its second city, Porto, looking set to steal that crown. It’s a wonderful country, with a varied and elegant cuisine that’s indebted to both the mighty Atlantic and the scorching Mediterranean. Here, salt cod is king, vast slabs of bacalhau hang in every grocers, ready to be rehydrated and turned into salt cod fritters or cakes, patties of cod fried in breadcrumbs until irresistible. Then there are sardines, grilled over charcoal on a beach in the Algarve, served with nothing more than a little too much salt and a good squeeze of lemon, or preserved in brightly coloured cans, each a work of art in its own right. There’s chorizo from Spain, and olive oil, and cakes and pastries, the famous pasteis de Nata, the very best of which come from a shop in Belem, a short tram ride outside Lisbon, the shop with the blue awning, whose pasteis will change any day for the better. Portugal is an excellent place to visit and an excellent place to eat. 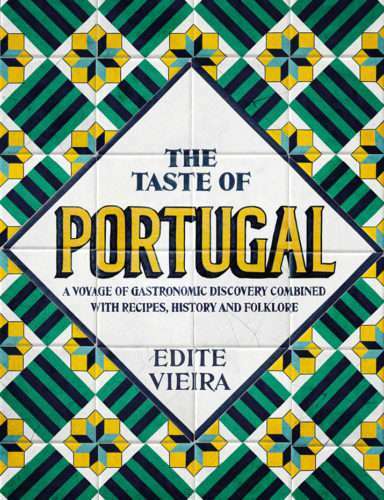 Edita Vieira’s book, The Taste of Portugal, was originally written in 2000, and is now in its fifth edition, and there’s good reason for that. Vieira’s book is as comprehensive a collection of Portuguese classics as you could hope to find. There’s plenty of salt cod, plenty of sardines, but also the taste of the country, stews of rabbit and chicken, kid marinated and cooked slowly in red wine, suckling pig. The sea is never far away in any collection of Portuguese recipes, and one of the recipes that Vieira includes is very familiar indeed – fish fillets, battered, fried and served with chips. Battered fish was essentially a Portuguese invention that migrated north to other parts of Europe with Portuguese Jews fleeing the Inquisition in the 1600s. Years later, one of their descendants, the enterprising Joseph Malin, found himself in London, and decided to open a shop selling one of his family’s favourite delicacies, which he paired, in a stroke of timeless genius, with chipped potatoes of the type popular in France, and here we are today, still eating Malin’s invention. For the record, Vieira’s batter recipe is very solid – 60g of plain flour, an egg and some water. It could only be improved by replacing the water with beer. The Taste of Portugal is an old book, but it’s as relevant as ever. It concerns a cuisine of quiet authenticity that’s described with love and passion and a stubborn individuality that’s characteristic of Portugal as a whole. There’s a heart to Vieira’s writing that shines through her clear and descriptive recipes. That The Taste of Portugal is reprinted here in a modern edition, newly revised and updated, is a triumph for quality cookery writing. It’s a wonderful book.